Hair Styles are the styles to make your hairs look goods, manageable and to enhance your physical looks to choose from to make it within time. Imagine that It’s 10 minutes to 8 O'Clock. 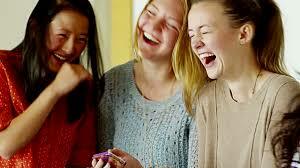 You are getting your daughter ready for school. Your daughter’s lunch box is lying half-packed on the table and the school bus will arrive any minute now and start blaring its horn. And if it drives away without your sweet little angel on it, you will have to fight through hellish morning traffic to drop her off to school. It doesn’t help that now she’s whining to you that you need to do her hair and make it look “all pretty like a princess.” So, when you’re in a time crunch, this close to blowing your top off, just take a few deep breaths and remember that I’m here to your rescue! Below, I’ve compiled 20 cute and easy hairstyles for school girls that are trending right now…along with instructions detailing how to do them! I know, I know, you love me. So, without further ado, let’s get right into it! How many times and how many different waterfall braid tutorials have you watched before getting daunted and giving up on doing it completely? Too many, I assume. Well, this simple hack of a hairstyle is so pretty that your daughter can sport it to the many birthday parties she gets invited to. From the side with more hair, pick up a 3 inch section of hair, braid it right till the end and secure it with a hair elastic. Insert your thumb and index finger through the center of the first stitch of the braid and pick up a small section of hair from the front of your head. Keep repeating steps 3 and 4 down the braid until the waterfall effect has reached in line with her parting on the other side. Start off by brushing all the knots from your daughter’s hair and tying it into 2 mid-level pigtails. Flip her pigtail over and into this gap to topsy tail it. Bring both the sections together and tie them up with a hair elastic to create a heart. Who doesn’t believe that their beautiful daughter is a gift from up above? So, dress her up like one and adorn her hair in an adorable little bow. Not only will she look cute, it will also have her classmates fawning over her gorgeous hairstyle. Sometimes, the hairstyles that take less than 3 minutes to do are the ones that look the fanciest. Case in point, this triple low buns updo. It’s perfect to do on second or third day hair, especially on days when your daughter has gym class. From the side of her parting with more hair, pick up a medium sized chunk of hair, braid it right till the end and secure it with a hair elastic. Pick up another section of hair from beside this first braid and repeat the previous step. Pull back these braids and pin them under the hair at the back of her head to finish off the look. 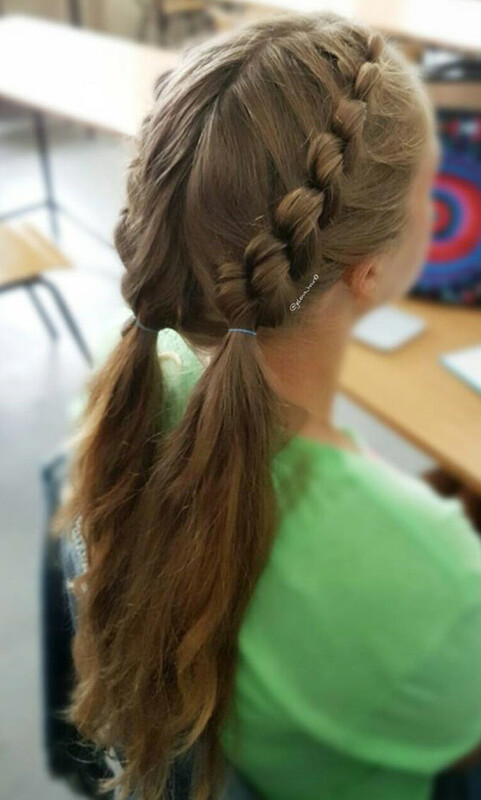 Struggling to come up with a hairstyle every time she has a class party/school dance to attend? Here’s a hair look that will get you out of your pinch swiftly. These rose buns are super pretty and bound to make your daughter look like the gorgeous flower child that she is. Divide the top half of your little one’s hair into 3 sections. Individually braid these 3 sections and secure their ends with hair elastics. Pancake the left side of all 3 braids. Spritz on some texturizing spray on them. Hold down the top of the first braid with one hand and start rolling the braid around it in a clockwise direction with the other hand. Keep pinning down the braid to her head every time you finish a half circle. Tuck the end of the braid under the completed rose and secure it down with some bobby pins. Repeat steps 5 to 7 with the other two braids to complete the look. Leaving out the front sections of her hair to frame her face, part her hair horizontally (from ear to ear) to divide it into 2 sections. Clip the bottom section with a sectioning clip to keep it out of the way. Tease down the top section of hair to create volume. Smoothen down the top of the teased section and tie it all in a ponytail with a hair elastic. Start braiding this half ponytail. Once you have braided for about 3 stitches, unclip the bottom section and start adding sections of hair from the sides into the braid with each stitch (start French braiding, basically). Once you run out of hair to add into the braid (when you’ve reached the nape of her neck), simply braid right till the end and secure with a hair elastic. Cut off the hair elastic at the top of her braid. Tug apart and loosen the braid to make it look wider and give it a softer vibe. Pick up a medium sized section of hair from right next to the partition and divide it into two sections. Start French twisting these two sections by flipping the front section over the back section and adding more hair into the twisted braid from the side of her head with each twist. Once the French twisted braid has gone past her ear and you’ve run out of hair to add, simply secure it with a hair elastic. Gather all of her hair and twist it into a side bun under the French twisted braid. Prep your little one’s hair with some heat protectant and curl the lower half of all her hair. 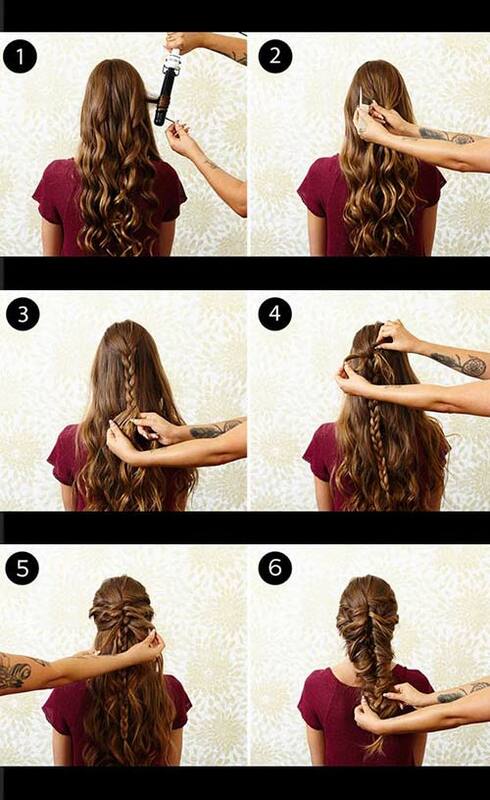 Pick up a big section of hair from right on top of her head and braid it right till the end. From the left side, pick up a 2 inch section of hair from the front, twist it right till the end, and insert it into the first stitch of her braid. Now, from the right, pick up another section of hair, twist it right till the end, and insert it into the second stitch of braid. Alternating sides this way and working down the braid, weave all her hair into the braid. Secure the ends with another hair elastic. Pin down any sections of hair hanging loose. Gently tug the braid apart to give it a fuller look. I know you have those days when you don’t feel like getting out of bed to send you kid to school. What makes it worse is the thought of going through all the motions of dressing her up. On those lazy days, here’s a simple hairstyle for school girls that will take less than 5 minutes to do and still make your daughter look presentable at school. Divide all of your daughter’s hair into 3 sections. Individually braid these 3 sections and secure the ends with hair elastics. You should end up with 3 braids lying right next to each other. With these three braids acting as individual strands, braid them into one giant braid and secure it at the end with a hair elastic. Here’s a hairstyle that will be perfect for your little angel when she has any kind of sports class or tournaments. Besides looking oh-so-trendy, Dutch pigtails can work great to keep all of her hair neatly off of her face. Another bonus for you is that it will be super easy to brush out her hair after untying these braids as they will prevent knots and tangles from forming in her hair. Part your little one’s hair slightly off-center. Continue parting till the nape of her neck to divide all her hair into 2 sections. From the very front of the left section of her hair, pick up a 3 inch section of hair and divide it into 3 sections. Start Dutch braiding these 3 sections by alternately flipping the side strands under the middle strand and adding more hair into the braid from both sides with each stitch of braiding. Once the Dutch braid has reached the nape of her neck and you’ve run out of hair to add into it, simply braid the rest of the way down and secure the ends with a hair elastic. Repeat steps 3 to 5 on the right section of her head to complete the look. Hit the snooze button way too many times, did you? And now there’s no time to do your kid’s hair. But, wait a minute! This is exactly the time that Zoella will come to your rescue! Her simple messy bun will take you about 2 minutes to do on your baby’s hair and make her look super cute. Brush out all the knots and tangles from her hair. Tie all her hair in a high ponytail. Twist the ponytail right till the end. Roll the twisted ponytail into a bun and place it flat against her head. Make sure the ends are tucked under the bun. Secure the bun with a hair elastic. Pull out some sections from the front to frame her face. Secure any loose sections of the bun with bobby pins to finish off the look. Too often, kids complain about their tight ponytails giving them a headache. Here’s a simple hack hairstyle that will solve the problem and add a cute little twist to an otherwise ordinary ponytail. All you need is a couple of bobby pins to perfect this look. Leaving out the front section of her hair, tie all her hair at the back into a mid-level ponytail. Part her front hair on one side. Pick up all the hair on the side of her parting with lesser hair and pull it back. Place this section of hair across the top of her ponytail and pin it down on the opposite side, right next to the hair elastic. Repeat the previous step with the front section of hair on the other side to finish off the look. Reaching the end of the school year and the summer heat is starting to set in? There’s only one way your little lady can be prevented from driving herself (and you) up the wall because of the heat – by tying her hair into an adorable twisted updo. Part your daughter’s hair down the middle and divide it into sections. Tie both the sections into ponytails right at the back of her head. 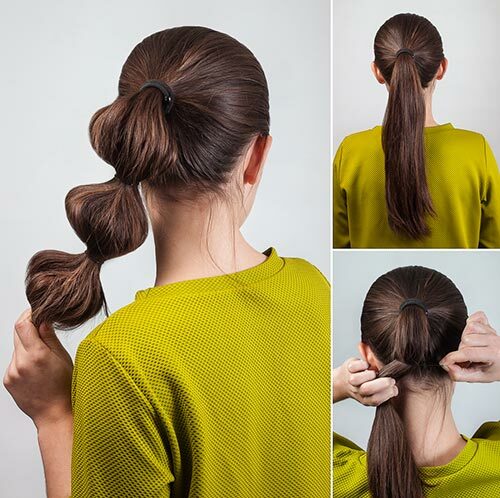 Divide the left ponytail into 2 sections. Individually twist these two sections right till the end. Intertwine the two twisted sections with each other and secure the end with a hair elastic. Repeat steps 3 to 5 on the right ponytail. Wrap these two twisted ponytails with each other into a bun and secure it to her head with some bobby pins. Gently loosen the twisted bun to give it more dimension and finish off the look. Easy to do and looks super cute, this bubble ponytail is going to be your baby girl’s new favorite hairstyle for school. With just a few hair elastics, transform her boring ol’ ponytail into a stylish hairstyle that she will beg you to do every single day. Brush back all her hair and tie it into a ponytail at the back of her head. About 1/3rd of the way down her ponytail, tie another hair elastic. Now, pull up and apart the hair between the hair elastics to give it a bubble effect. 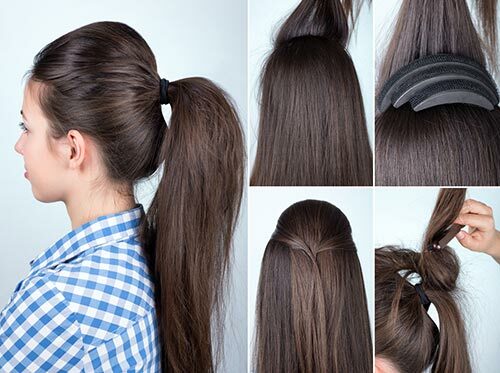 Keep tying hair elastics and “bubbling” up her hair until you reach the end of her ponytail. Trying to send your child off to school with a simple ponytail but she starts protesting that it’s “too boring”? A quick hack to get out of this situation is to incorporate this twisted style into her ponytail. Takes about 2 seconds to do and you’re both happy! Tie your baby girl’s hair into a high ponytail. Individually twist both the sections in a clockwise direction right till the ends. Intertwine both the twisted sections with each other in an anticlockwise direction till the end. Your little girl is growing up and pretty soon she’ll want to rock hairstyles that will make her look ~cool~ at school. Be prepared for that day by trying out this ponytail look that is appropriate for school but still looks chic. Insert a bumpit under the hair at the crown of her head. Use a fine toothed comb to smoothen down hair over the bumpit. Gather all her hair and tie it into a mid-level ponytail. Tease down the hair at the base of her ponytail. Smoothen down hair over the teased hair using a fine toothed comb to finish off the look. Try out all the funky cute hairstyles on your little one while you still have time because pretty soon she’ll become an irritable teenager who won’t let you anywhere near her hair. This adorably twisted side ponytail style is one such look you definitely need to try on her. Part your little one’s hair down the middle and continue the parting till the nape of her neck to divide her hair into 2 sections. 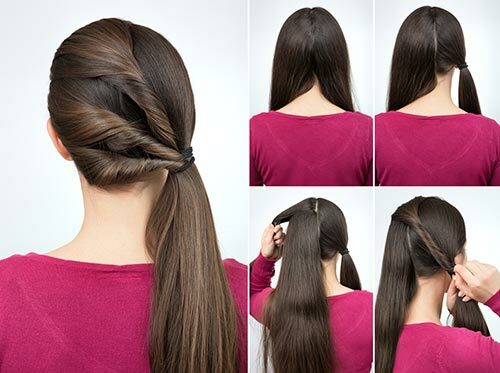 Tie one section into a low side ponytail. Pick up 1/3rd of the other section, twist it right till the end and tie it with the side ponytail. Pick up another 1/3rd section from right under the first one and repeat the previous step. Add the last section of hair to the ponytail in the same manner to finish off the look. Get ready to thank me because I’m about to show you 2 hairstyles at the time and effort of one. This braided updo style can be done up in 2 ways that look equally gorgeous. Ask your little lady what style she wants to go for that day and leave the decision up to her! Part your little girl’s hair down the middle and divide it into 2 sections. Braid both the sections of hair right till the end and secure them with hair elastics. One way to style this look is by placing the braids across the back of her head, folding and tucking the ends under, and securing with bobby pins. Another way is to place the braids across the top of her head and pinning them down behind her ears on the opposite sides. Finish off the look by clipping on a cute hair bow or flower. Phew, it sure is tiring being a mum! But going through all this effort to style your little angel’s hair is worth how happy and cute she will look at the end. So, comment below and let us know which school girl hairstyles you absolutely loved and which ones you know your little one would be excited to try out! 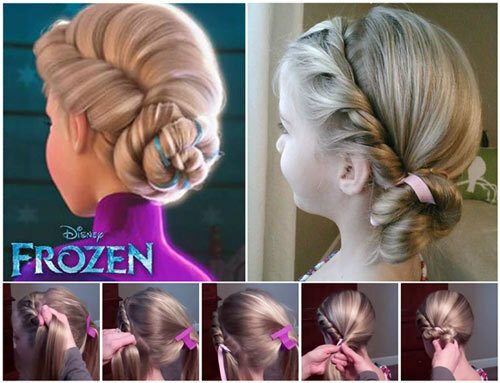 Make your sweet little princess look like a ballerina (even if she isn’t one) with the help of this hairstyle. This adorable bun style will neatly keep her hair out of her face while still making her look oh-so-cute. All you need is a little hair bow to complete the sweet look. 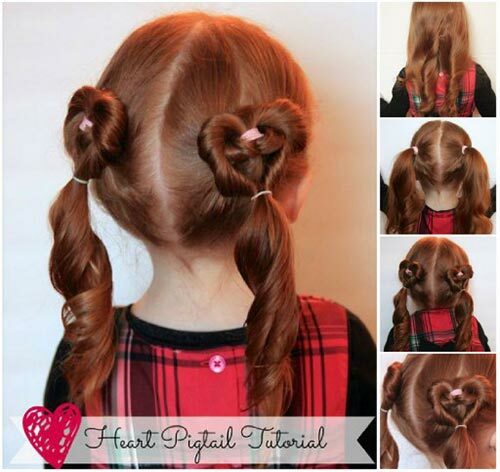 Tie your little one’s hair into a high ponytail. Leaving out a 2 inch section of hair from the bottom, roll her ponytail into a bun and secure it to her head with some bobby pins. Divide the left out section of hair into 2 sections, twist them right till the end, and intertwine them with each other. 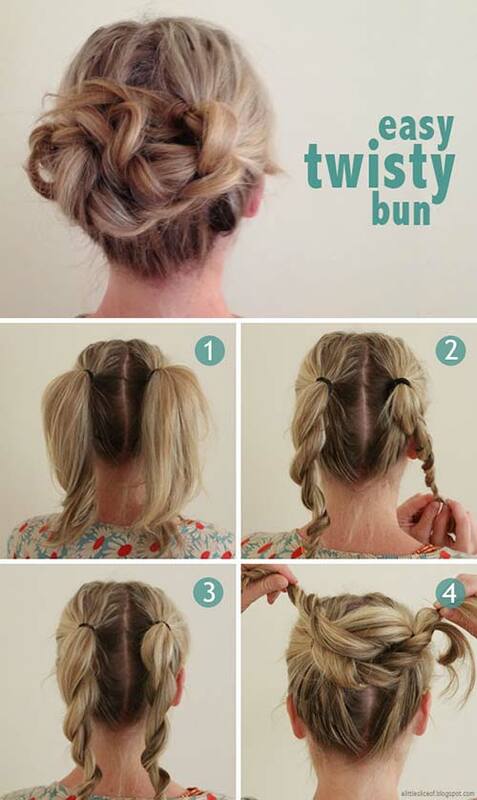 Wrap this twisted up hair around the base of her bun and pin it in place. Pin her hair bow under the bun to finish off the look.